We're going to speed up the last few Infinite Tee combinations by combining them into two posts. We have some EXCITING news regarding the Infinite Tee to announce soon, so keep your eyes open! for a light pink Tee, and the black cardigan for a white one, allowing for a lighter look. Here’s our first official “formal” look for the versatile Infinite Tee! Franciscan flair. Personally, this is my favorite! quality of the Tee makes a wonderful, edgy look, while the V-dress keeps it professional! need to worry about getting lost in the fabric! or a day in the city, this look is the perfect amount of edgy and dressy combined. Stay tuned as we show you two more ways to wear our versatile Infinite Tee! We love our Infinite Tee and the many ways to include them in your wardrobe. Our intern Janette did a great job of showing us how to do it. A 5" x 7" card of this illustration is included in each purchase. 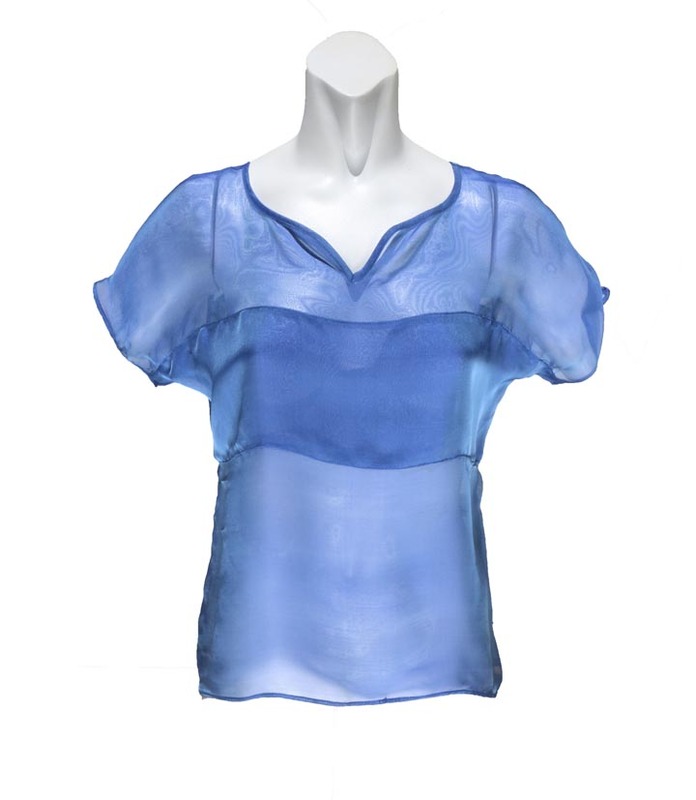 The Infinite Tee, with its layers of sheer chiffon, makes a wonderfully versatile top perfect for any relaxed situation. Illustrated here is a casual outfit to be worn out or at home. This woman wears a light pink Infinite Tee over a lemon yellow Reversible Tank, with white Stretch Knit Pants for a loose, casual look. Personally, we love the light sunset hue that comes from the combination of the light pink Tee and the lemon Tank, but the yellow tank can also be reversed to white for a lighter, more subtle look. Perfect for errands around town, a trip out with friends, or a neighborhood party, this look is a relaxed and polished summertime ensemble. Stay tuned as we show you seven more ways to wear our versatile Infinite Tee! With its unique layer design in sheer chiffon, the Infinite Tee is a versatile top that looks great with any outfit. Perfect for situations as different as a night out with friends and a night at the workplace, the Infinite Tee is a prize addition to any outfit. Illustrated here is an outfit to be worn casually out or at home. This woman combines a light pink Infinite Tee with a pair of faded and cuffed jeans, half tucked in for a loose, relaxed look. This outfit can be worn with a white tank top underneath if you want to make it a little more formal, a lace bra if you want to make it a little more risqué, or nothing at all underneath if you just want to relax. We think this look would be wonderful for a casual outing with friends, a night at the movies, or a relaxed day at home. Stay tuned as we show you eight more ways to wear our versatile Infinite Tee! Not only is it versatile and beautiful, the story behind the Infinite Bandeau is what makes this top truly unique. It all began with the idea of repurposing the extra silk chiffon Camilla had in her studio. This idea sparked inspiration for a project that could be done among Camilla’s interns. Using one of Camilla’s previous patterns, as well as adding the double layer around the bra line, the Infinite Bandeau top, and project, was brought to life. Together the interns brainstormed different marketing, positioning, and sales techniques. How could we use the extra chiffon and previous pattern in the most sustainable way possible? How could we, as interns, learn more about responsible business practices through this project? In addition to this, we decided to donate half of the profits received from the Infinite Bandeau top to a local non-profit organization. Our marketing includes anti-bullying programs touching on the idea of society conveying an unattainable expectation of beauty. Camilla has been working to support this idea in other ways as well; for example, her This is What it Looks Like campaign, limiting and disclosing all uses of Photoshop. All clothing and models are portrayed exactly how they are; we only use Photoshop to resize, adjust lighting, and remove backgrounds. We are working to redefine beauty to match any identity. With the new versatile Infinite Bandeau top, this is made effortless. Be 100% you! Come see it in person at Camilla’s redesigned studio Friday or Saturday 12-5pm, and meet some of the interns 12-1pm on Friday. RSVP for lunch! Life today is always lived on the clock. Women are busy and on the go. The modern woman is constantly changing “hats” on a daily basis: from wife, mom, friend, working professional, and sometimes student. If this is true, why doesn’t her closet reflect that? Why don’t her clothes easily take her from work to play? These are the questions designer Camilla Olson asks herself which led her to design the versatile Infinite Bandeau Top. The Infinite Bandeau top is not your average Tee. Camilla designed a double layer around the bra line allowing you to wear it with a tank underneath or just a beautiful lace bra. The color blocking in the bra line also makes it eye catching by how it perfectly encircles the torso. 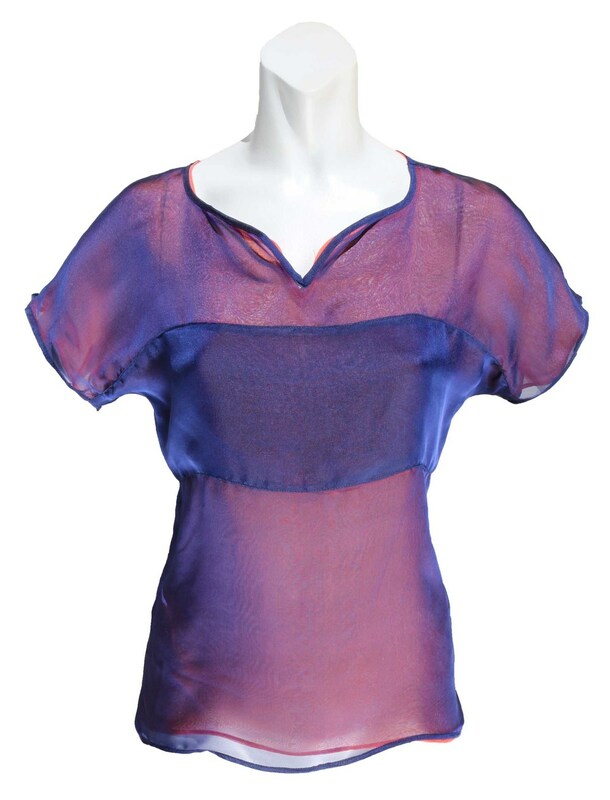 Made from 100% silk chiffon, it is soft to the touch and “Ridiculously Comfortable”. The Infinite Bandeau top is truly the most versatile piece a woman can have in her closet. Dress it up with a blazer and dress pants for work. Pair it up with your favorite jeans for a casual look. Make it chic with dress shorts and a blazer. Use it as a swimsuit cover up. The possibilities are infinite! Be daring or demure, have a pop of color or keep it simple, dress it up or dress it down, the Infinite Bandeau top is truly more than just your average Tee. Fashion for any woman. This is what “It” looks like.